As we see, not all suffering that a Christian has to go through, is suffering for Christ, or suffering for the sake of Christianity. We could be the cause of it ourself! These three things that are mentioned here first, we're probably not guilty of I would think - especially when we stop and look at what we usually connect with this: "murderer, or thief, or evildoer." (v.15). But what does the word of God say about this? Who is a murderer for example? Listen to what the apostle John writes to the congregation? "Everyone who hates his brother is a murderer; and you know that no murderer has eternal life abiding in him." (1 Joh. 3:15). Everyone who carries something evil towards another human being! Everyone who holds any grudge towards someone else! Are there any murderer in here then? And listen to what happens to the one who remains with a grudge against someone, takes care of it and does not want to let go of it - seek forgiveness for it: "- you do know that no murderer has eternal life in him." In him! Which means that the Holy Spirit steps aside from you and at last leaves from you. Which means that you loose eternal life! You are grieving the Holy Spirit! Thief! What about stealing another mans honor? How often doesn't that happen! You say something unprofitable about a person. You join other people in spreading a rumor about him. We even steel honor from God, when we boast about ourself, and glory in ourselves in something God must've done by us! What if you neglect to do your chores in your job or other connections, where people count on you to do what you've been trusted to do? There are other examples that can be used as well. Are there any thieves in here then? Evildoer! Sounds very boisterously - but it doesn't mean anything else than that you've broken a law! Every time you step harder on the accelerator pedal than what the speed limit says, you brake the law! If you cross the road anywhere else than on a pedestrian crossing, you brake the law! Well, the Norwegian law you may say. No, Gods law demands you to obey the authorities! We could go further and speak about taxes - do you always do what's right? What about selling something more expensive than what it's really worth and so on. Are any evildoer in here then? If you must suffer for any of these things, you do not suffer for Christ's name sake! And then we must include the fourth things here: "- or a troublesome meddler." One can cross the line over what is called a human beings integrity. You may simply attack a person, sometimes with the word of God, and hide it under Christian radicalism. It is really an insult. One speak about a persons relationship to God for example, without having anything specific to show. You may often have thoughts about someone else's relationship to God, because you cannot achieve any contact and other things, but judgment belongs to God! You may cause damage that cannot be mended, if you let your tongue run away with you. We have seen a lot of miserable and unwise things happen concerning this among us! Listen to what the apostle says here: "And if it is with difficulty that the righteous is saved." (v.18). With difficulty! That is a strong expression! Which means - just about! But he is saved, as long as he is righteous! A righteous man cannot perish! Which means, one who keeps - or rather cling to - the righteousness that have been given him in Jesus! But look how easy it is for something to enter in! Something that drives you away from this righteousness! Something that makes you not dear to believe, because your consciousness has become so weighed down! Or this other thing has got a hold of you, so that you hold on to that! Then one may think: Oh, this must be me! How can i now know how I'm doing? I want to ask you this: Do you come to Jesus with everything? Are there no room in there that are shut and dark for Him? Are you willing to let go of everything for His sake? Do questions like these create a restlessness and struggle inside of you? You probably have heard Jesus words: "- and the one who comes to Me I will certainly not cast out." (Joh. 6:37). Yes but what if i don't have anything else than thousands of sins to show? A heart so twisted and so evil? Then i would like to ask you: Do you have anything better to show? Do you have to suffer because of this - scorn and raillery from the world, contempt in the religious flock, all kinds of attacks from Satan and his spiritual army - because you have become a meek person - which means one who has given his all in the Lord's hand, and counts on Him, then the spirit of glory and of God rests on you. (v.14). It is a blessed place to live, but it follows suffering! "Beloved, do not be surprised at the fiery ordeal among you, which comes upon you for your testing, as though some strange thing were happening to you." (v.12). It is certainly not strange - it's exactly what the word says is normal: " Indeed, all who desire to live godly in Christ Jesus will be persecuted." (2 Tim. 3:12). Notice that it doesn't say: The one who wants to live godly! Because the world - also the very worldly one, and especially the religious one - can have great understanding, and even admire the godly life - which means religiosity. But it says here: All who desire to life godly in Christ Jesus! That means, those who live by the things of God and not of man. Do not count on any understanding, and do not count on any mercy and compassion! But listen to what the Lord teaches you through the apostle here: "- but to the degree that you share the sufferings of Christ, keep on rejoicing, so that also at the revelation of His glory you may rejoice with exultation." (v.13). Is your life so nice - have you adapted so well in this life that you have fallen asleep? Have you gone yourself or have you allowed yourself to be led into a situation like this, so that you avoid this suffering and persecution? We say: Wake up, and wake up in time! It may sit many people in the congregation, look out over the world and think and say: Oh dear how much they need to wake up! Oh yes, that's true! But perhaps you need to wake up more than anyone! Is your Christianity Jesus? Has it ever been? Has it become something else? "- it is with difficulty that the righteous is saved," writes the apostle. It is only Jesus that will do you know! Godliness, deeds and works and whatever else you may think of, many different people have, but Jesus, only the born again have Him! "But may it never be that I would boast," - listen to the expression! : - never be! "except in the cross of our Lord Jesus Christ." (Gal. 6:14). Ask yourself tonight! Will I never boast? At last, listen to this! The righteous is saved! If so with difficulty - yes, yet so as through fire. (1 Cor. 3:15). The righteousness you have been given by your refuge in Jesus, your Savior, is complete! Then stay in Him! Remain in His love! 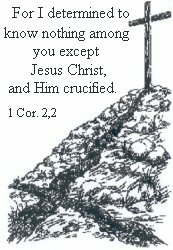 And do not count on any thing else to salvation than the love of God that is revealed on the cross of Golgotha! Because there - and only there - has God taken care of your business! There He had a complete liquidation with your sin, through another person - through your deputy for God, Jesus Christ, God's own Son! Just listen to what Jesus Himself testifies of as He hangs there and finishes this task: "It is finished!" (Joh. 19:30). It is completed! What? That which had to be done so that you should be saved! God has gotten what He required for you! The ransom is paid! But two things: Who are you who do not want to confess as sin what Gods word clearly teaches is sin - and come to Him with what it is? Do you mean you have the Holy Spirit and belong to the Lord? On the other hand: Have you become so pious or Christian, to use a more modern language about it - that you no longer have your hope in the sacrifice that is brought on Golgotha, alone? Alone! To be pious is not the same thing as being Christian as Luther says. You will hear a testimony of a well known Christian about her piety, at last - Lina Sandell: "The only piety i know - or sense - is the forgiveness of sins." Do you live here - in this - then suffering will not, in shape of resistance, scorn and raillery stay away either! But listen to the word of the apostle: "The Spirit of glory and of God rests on you!" And that is a blessed place to be!